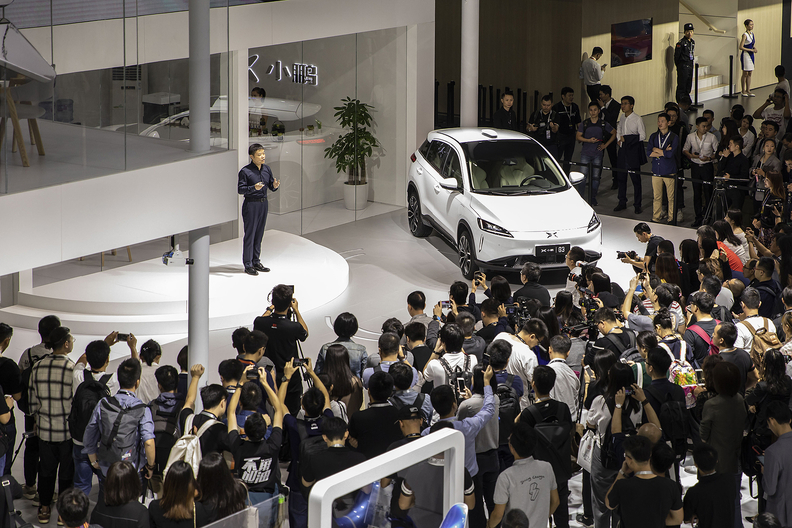 He Xiaopeng, chairman and co-founder of Xpeng Motors Technology, introduces the company's G3 electric crossover at the Guangzhou auto show in China on Nov. 16, 2018. But He may be the most Musky of them all, trolling the Tesla CEO in his posts on Weibo, the Chinese version of Twitter. He’s now on the hunt for additional funding after raising more than 10 billion yuan from investors such as e-commerce giant Alibaba and iPhone assembler Foxconn Technology Group. The automaker’s full name is Guangzhou Xiaopeng Motors Technology Co., and it has a valuation of about $3.65 billion, according to venture capital database CB Insights. Xpeng, which contracts production to Haima Automobile Group Co. in Zhengzhou, is ramping up capacity to try to expedite delivery time. The company started deliveries of the G3 electric crossover in December but doesn’t disclose sales. The starting price for a Tesla Model 3 in China is about double the price of an Xpeng because of taxes. “Once Tesla has built that factory in Shanghai, I think it would be a huge challenge for Chinese EV makers,” Feng said. He wants to scale up his r&d team this year, adding hundreds of workers with a focus on autonomous driving, artificial intelligence and internet connectivity. His company’s biggest challenge will be educating customers, and that Tesla, which he doesn’t see as a competitor, will play a major role in that.